I have a very hard time believing that many of the things I grew up with, the things that molded and shaped my ideals, are releasing anniversary editions in their second decades. My review for today will be pretty simple. The novel is not the typical kind of book I read or review, but I could not pass up a chance to reminisce about my valley girl roots. I had to wait a really long time if I would be approved for this novel. I had almost lost hope that I would get it in time for the release. It was so easy to get immersed in this collegiate thesis on such an iconic movie. Jen Chaney takes the time to explain how a chancy adaptation of Jane Austen's Emma could become a staple to Generation X and Generation Y. Many others from the previous generations also enjoy the movie, but it ultimately created a new identity for those born after 1975 without ever meaning to do so. The whole book is written wonderfully. All of the anecdotes really make you feel a part of the movie from a personal level, not as an audience member. I never felt exhausted by the format of formal thesis writing. Nothing was above my head or pompous. It had a beauty and comedy just like the movie it is immortalizing. It was so great to connect to my favorite movie in yet another way (instead of watching it for the unknown time and driving my husband from the room). 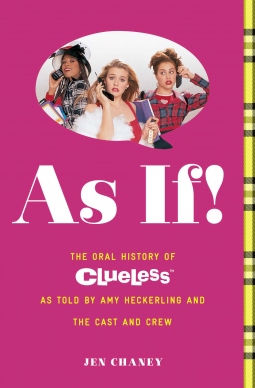 Happy release day to the cast and crew of Clueless and Jen Chaney for taking the time to solidify the immortality of such a staple movie. I know this is a different kind of book, but I highly recommend it.